Here are some pictures of when Shannon and Danette and cousins came up to visit us. Matching swimsuits!!! 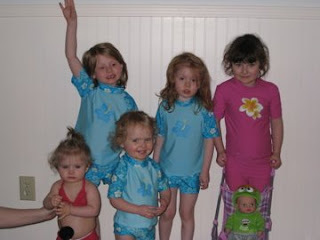 In the back starting on the left: Cassidy(5) Kayla(3) Ally(4, daughter of a friend of Shannons and Danettes), then on the bottom in Abby(11 months, born on Zoey's birthday) and Zoey!!! The big Slide at JJ Jumps. 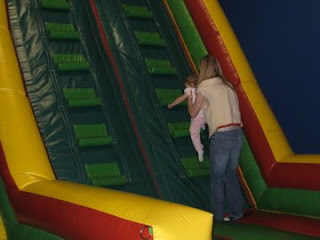 Zoey was too small to go up by herself so mommy had to help. Wasn't very easy. 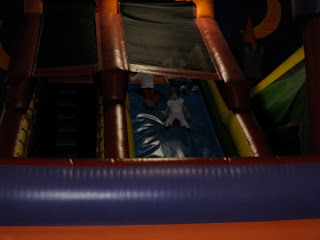 The big slide in back and the obstacle course that Zoey was afraid of in front with Zoey. 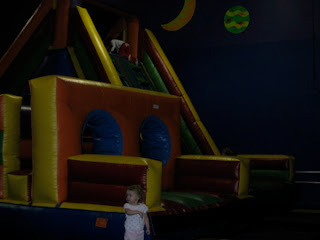 Zoey's favorite slide at JJ Jump. Was able to get up there and do it all by herself. 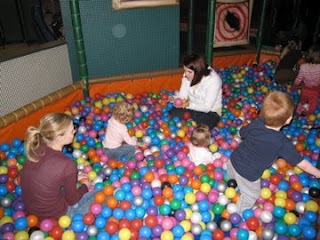 The ball pit at Kids club. Danette and Abby were with us.